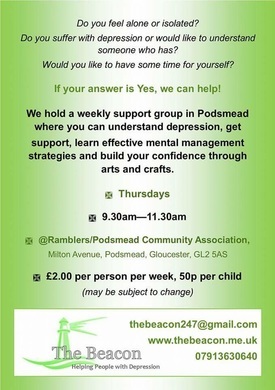 ​will be held on the 6th June at 7.00pm at the Independence Trust premises in Cheltenham. Please bring along something that inspires you. That could be a photograph, words, a thought….We are going to abstract paint, and print. Places are limited so please message meat stephen.moore2013@icloud.com by the 3rd June to confirm that you are wishing to attend. 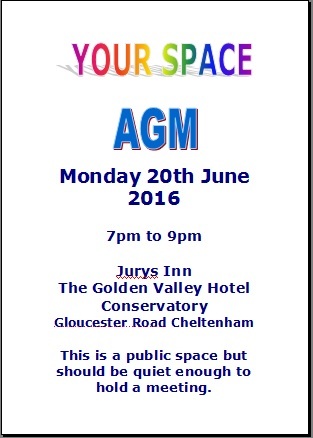 Our annual YourSpace AGM wiil be happening see poster opposite. the Jurys Inn, Cheltenham is situated just at the top of the Golden Valley by pass. We will be meeting from 6:45pm in the Conservatory Bar, Come and listen to what YourSpace has been up to and what proposals are for the coming year. Next OCD meeting will be on Sunday 26th June 2016 at St James Church School Lane in Quedgeley GL2 4PN or see poster for contact details.